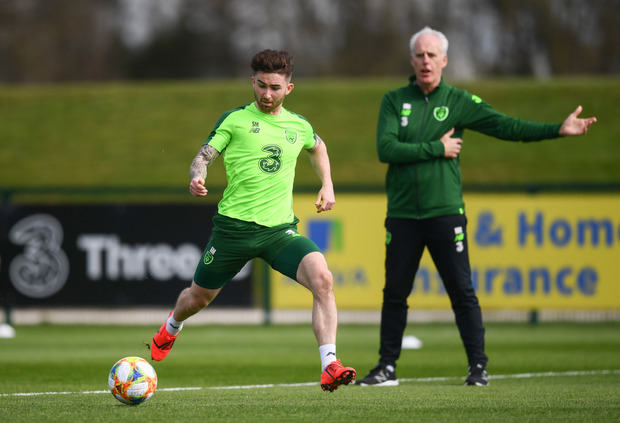 Sean Maguire will make his first competitive start for Ireland this evening as the Boys in Green start their Euro 2020 qualification campaign in Gibraltar. It is the first game of what is Mick McCarthy's second spell in charge, and he has named an interesting side for the challenge. As expected, Seamus Coleman and Matt Doherty have both been named to start, with the latter expected to play on the right wing. Coleman captains the side, which includes Shane Duffy and Richard Keogh in the centre of defence. Conor Hourihane and Jeff Hendrick are expected to play in the midfield, with James McClean on the left wing. Maguire will be partnered by David McGoldrick up front. The game kicks off at 17.00. Ireland XI: Randolph, Coleman, Keogh, Duffy, Stevens, Doherty, Hendrick, Hourihane, McClean, McGoldrick, Maguire.